translated, it means "fine ice creams", and we all know I'm a sucker for those. hehehehe. I was shopping way too late last night, but even though it was just shy of 10 o'clock, that doesn't mean I don't have 2 more minutes for my favorite part of the store. Just like a kid, my attention turned to some brightly colored boxes. 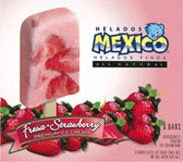 Helados Finos. Ok, I don't know what that means, but I do understand the universal language known as "A picture". Tasty looking picture too with big strawberry pieces mixed in with the bar. Hmmm, several fruity flavors to choose from. Rum Raisin or Mango? Nah. Coconut? Ummmmm, no way. Strawberry? Oh yeah, now we're talking. At the bottom of the box it says "Quiescently Frozen Ice Cream Bar". Again, I'm lost. "Premium Ice Cream" Now that I understand. "All Natural" Yup, I understand that too. Into the cart it goes, time to go home! Car's packed, keys in ignition, unwrap treat, drive home and start eating. Hmmm, interesting. Not quite what I expect, but interesting. I like the flavor, but the texture is kinda weird. The texture is more like a popsicle than ice cream. I guess the best way to describe it is that it is kind of rubbery. The strawberries sank to the bottom, but that's ok, it's the bonus treat at the end of the snack. I'm not huge of fruit flavors, and the texture is odd, but overall it's a pleasant change of pace. Ok, time to learn something: So I looked it up, Quiescently refers to the fact that the mixture is not stirred or agitated like ice cream is. This totally explains the strange texture. I would think it would taste better the other way, but I'm guessing it probably holds together better this way (it's not like it has a chocolate shell to keep it together). One more note: They have more flavors than the ones I saw, you may even spy them in the single serve format. Oh man, chocolate eclair! On Second Scoop: Big thumbs up from my wife on these tasty treats.